This post is in collaboration with Collective Bias, Inc. All opinions are mine. #CollectiveBias see my disclosure for more info. 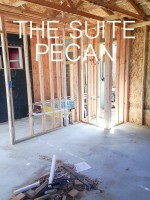 We have been diligently working on The Suite Pecan. 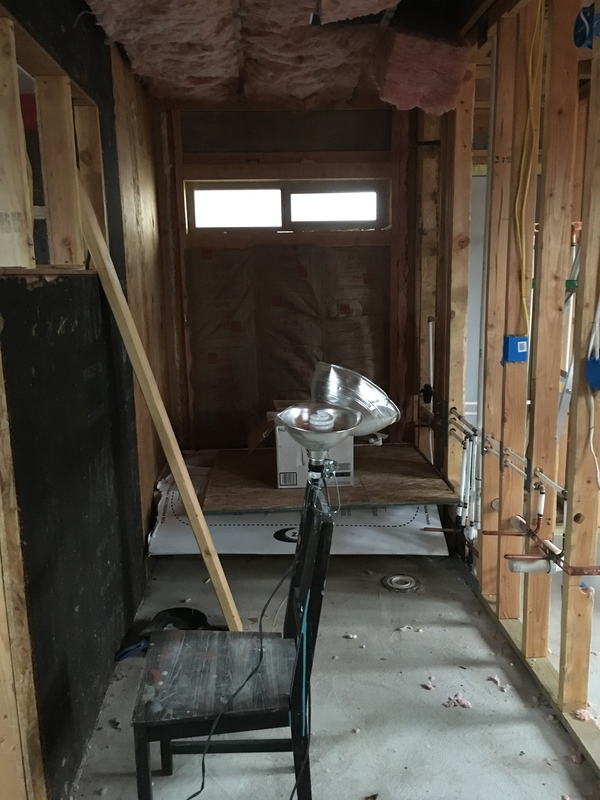 Between doing IVF, having a baby and a few bouts of builder burnout…..(ahem) it’s moving along. If you haven’t seen the before pictures yet they are a little scary, at least it gets way better! ….but it’s A LOT of work. 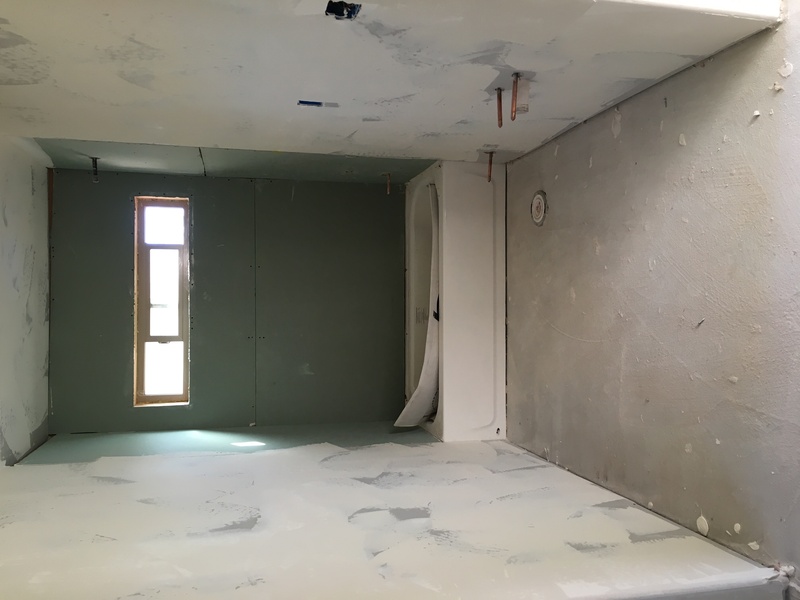 Since I haven’t shared any sneak peeks yet I thought it would be fun to show you part of the bathroom. 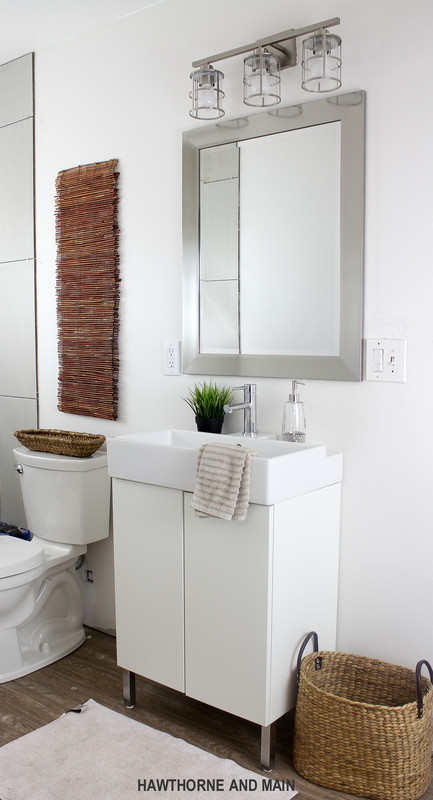 Today I am going to show you the paint color we decided on, the vanity with light and mirror. For your reference the vanity and everything that you will see here is located on the right in this picture. The hole in the floor is for the toilet. I am really digging modern rustic design elements right now and I want this space to be bright and simple. Since this space is small I want to bring in elements that cater to a bright and open feeling. The first decision I made for the space was paint. I love to paint but I don’t like repainting due to picking the wrong color. Been there done that… on more occasions than I want to admit. 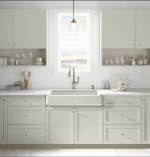 I used my tried and true method and decided on Alabaster by Sherwin-Williams. 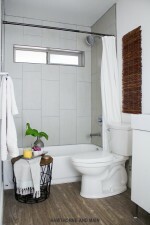 This color is a very warm and inviting white. I ran down to my local Lowes for the the paint. I debated and debated about lighting. Lights really make or break a space. I really think taking your time and picking the perfect light makes all the different. 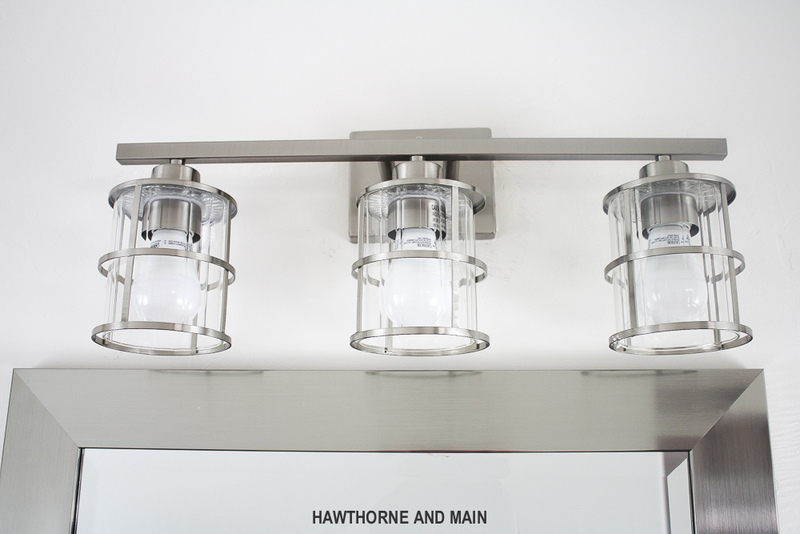 The light that I ultimately went with has some metal accents but still offers simplicity and brightness to the room. For me, picking the mirror was easy. 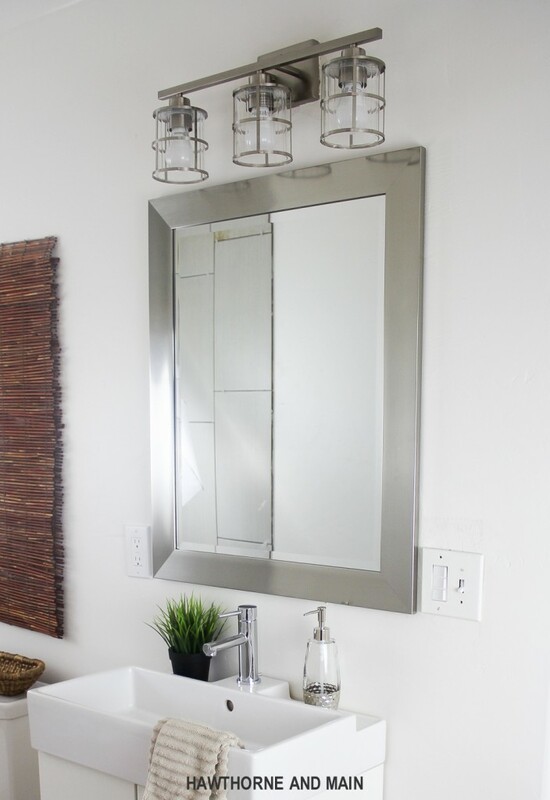 I went with a simple brushed nickel framed mirror. Since mirrors can give the illusion of more light. I picked a mirror that is as wide as the vanity. I think the mirror and the light fit the space perfectly. I got both of them at Lowes. This whole project has been hard but so fun. I am excited to show you more of The Suite Pecan soon. 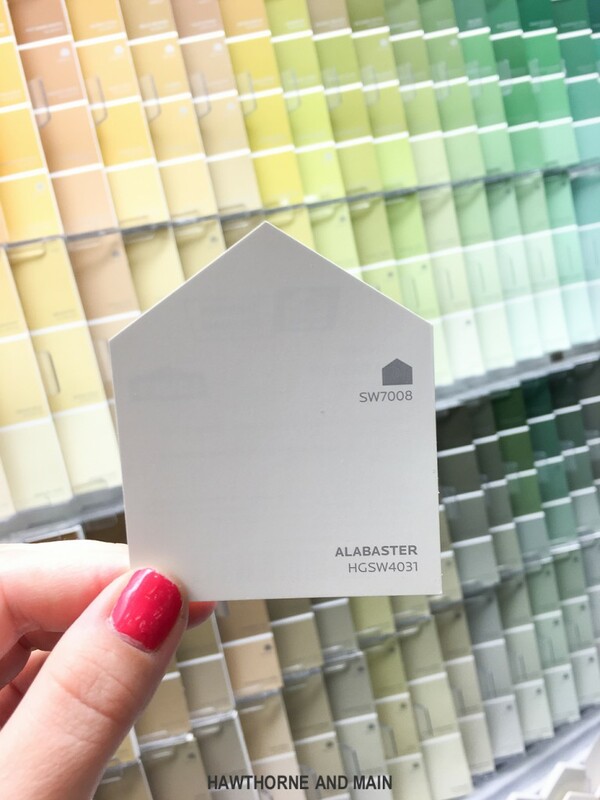 I am really into the bright white look but I am curious, what paint color are you loving right now? Your bathroom is beautiful. I know what you mean about enjoying the work but…a lot of work. My husband and I tackle a home project each year. 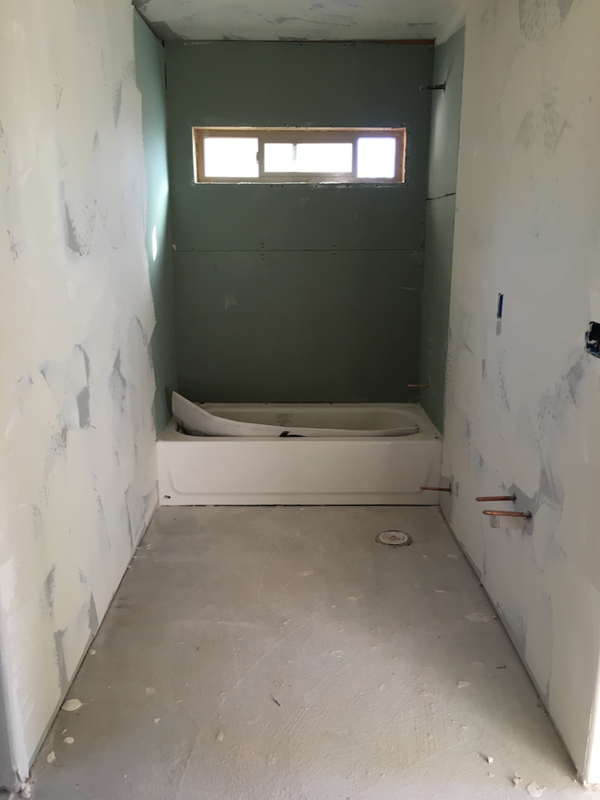 We had done my office remodel in March but 2 weeks ago our basement flooded so out cam wall, carpet etc…now we are working on that! Thanks Pamela! I am so sorry about your basement. I hope you are getting it all put back together by now. That is so frustrating when extra work comes your way. Hang in there! Love the colors you chose!! I’m loving more neutral colors of gray, beige, burlap with pops of yellow and teal. Your bathroom is beautiful! Thank you for sharing at Dream. Create. Inspire. Link! Pinning!